Register: Visit the Geodesign Summit website to sign up. 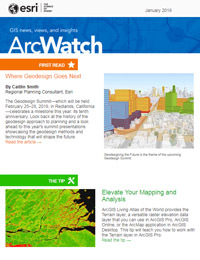 Learn more: Read a free e-book on geodesign. Ten years ago, Esri president Jack Dangermond made the case for geodesign in an ArcNews article entitled “GIS: Designing Our Future.” Dangermond took a retrospective look at the formative thinkers, seminal works, and concepts that gave birth to what we know today as geodesign: a collaborative design process systematically informed by geographic data and analysis to balance our natural and built environments. Dangermond also wrote about the urgency of adopting a geodesign approach to meet the challenges of the future—namely, how to better manage human impacts on earth systems. 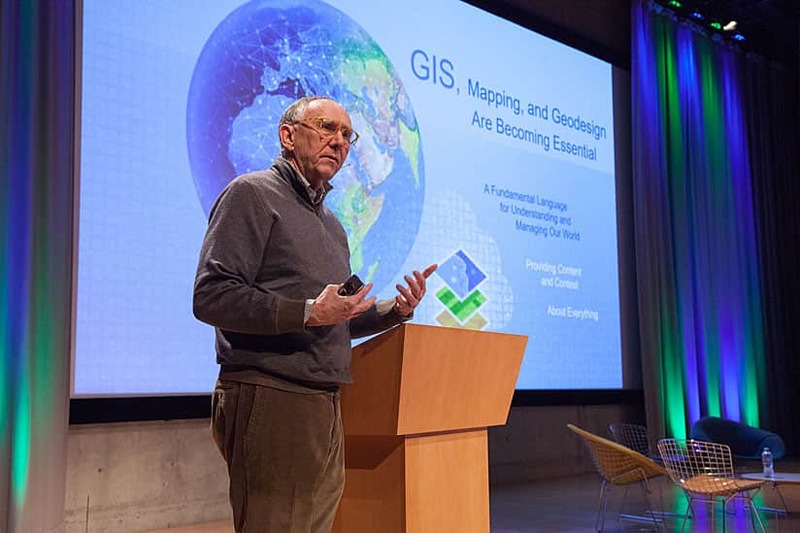 Esri president Jack Dangermond has long encouraged and supported the use of geodesign. On this tenth anniversary of the Geodesign Summit, Dangermond’s message and call to action resonate more than ever. The United Nations Intergovernmental Panel on Climate Change (IPCC) recently announced that the consequences of an anticipated 2.7 degrees Fahrenheit (1.5 degrees Celsius) rise in temperature will be far greater than expected. Serious impacts, such as worsening drought, biodiversity loss, and large-scale disruptions to infrastructure, are projected to occur as soon as 2040 unless new measures are taken to drastically reduce carbon emissions. The theme of this year’s summit, Geodesigning the Future, aptly summarizes a collective response to such pressing issues. This forward-focused event, which will be held February 25–28, showcases the minds, methods, and GIS technology that will help us understand, respond to, and shape the future. 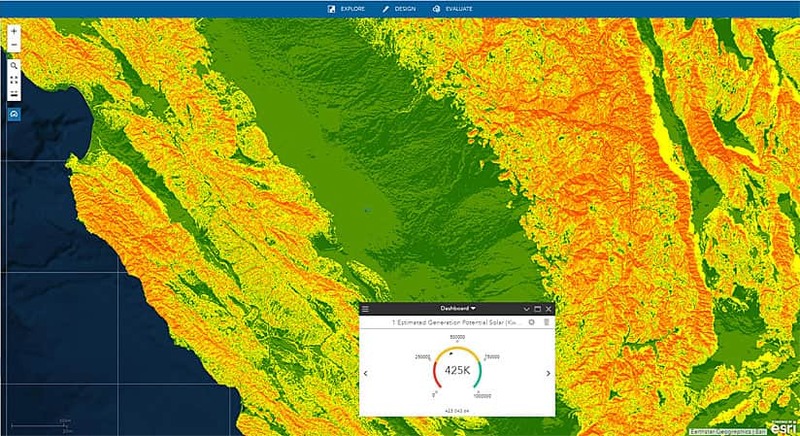 GeoPlanner for ArcGIS was used to assess the potential for solar energy generation in the San Joaquin Valley. This year’s summit will provide a wealth of perspectives on geodesign and supporting technologies that foster resiliency, adaptation, innovative asset management, and social justice. Presentations will cover diverse and innovative topics such as using digital game boards to assess future planning proposals, applying principles of biophilic design to decision-making, and simulating future what-if energy and greenhouse gas emission scenarios across different patterns of urban form. Presentations, Lightning Talks, and panel discussions will provide new insights in familiar territory, like emerging GIS tools to support planning across scales, while also highlighting geodesign’s reach into new areas, like indoor space management and emergency preparedness. Notable speakers at this year’s Geodesign Summit include David Rouse, director of Research and Advisory Services for the American Planning Association, and William Rogers, the 2017–2018 recipient of the Lincoln Institute of Land Policy Kingsbury Browne Fellowship and former president of The Trust for Public Land. Rogers will speak about the powerful influence of GIS and geodesign in conservation planning and advancing the mission of The Trust for Public Land. Rouse will muse on answers to the question, How can geodesign help solve big twenty-first-century problems? Others, such as Joe Minicozzi, principal of the design firm Urban3, will shed light on cost metrics, the financial impacts of design scenarios, and his firm’s unique communicative engagement processes. 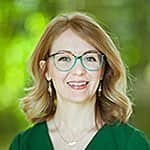 Kristy Senatori, executive director of the Cape Cod Commission, will share how her community is using geodesign to cope with sea level rise and other challenges. 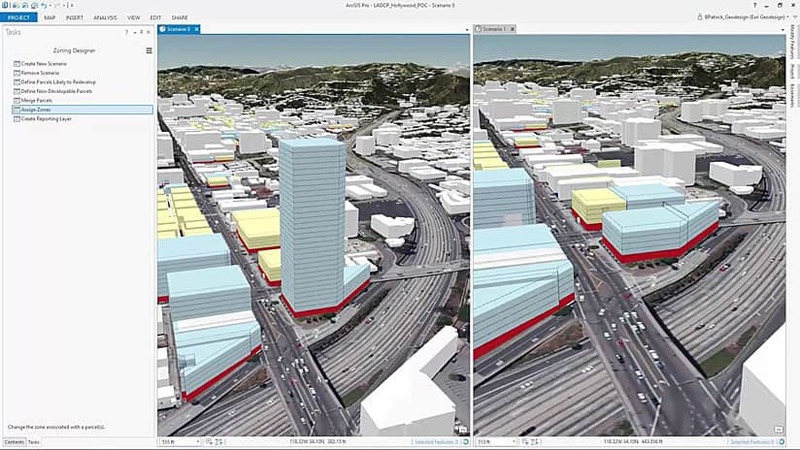 ArcGIS Pro’s 3D tools give you the ability to compare different building heights and space use scenarios.. In addition to these speakers, summit attendees will hear from land managers and agricultural specialists, local government representatives and urban planners, social justice advocates, and educators. They will also hear from students making presentations as part of the International Geodesign Collaboration (IGC)—an initiative led by Carl Steinitz, professor emeritus at the Harvard University Graduate School of Design and author of A Framework for Geodesign, published by Esri Press. The IGC brings together teams from nearly 90 universities worldwide to design and plan responses to pressing local and global issues. Their design explorations will be showcased at the Geodesign Summit, providing a forum for considering geodesign projects using a consistent framework and methodology across the globe. This year also marks Esri’s fiftieth birthday and the fiftieth anniversary of landscape architect Ian McHarg’s groundbreaking book Design with Nature. McHarg profoundly influenced the development of GIS technology through his initial use of the overlay concept to inform environmentally sound design. As Dangermond noted in his 2009 article, it’s not a coincidence that the concepts illuminated in Design with Nature and the GIS work led by Esri came about almost simultaneously. Both men shared a vision of using geographic analysis to design a better world. 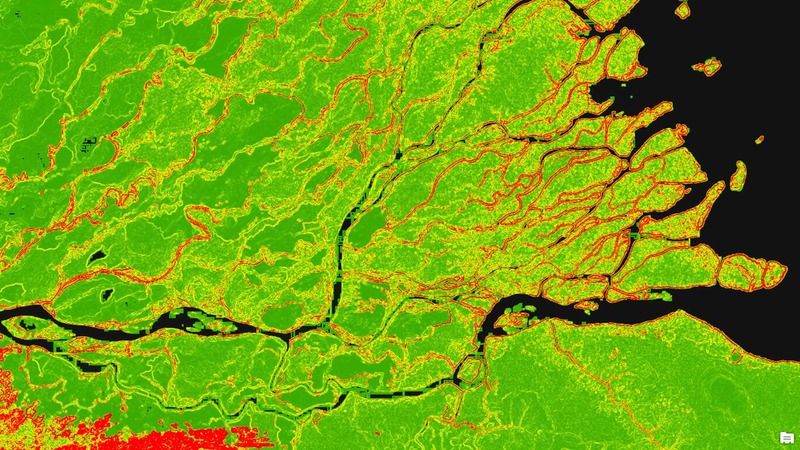 Over the past 50 years, increasingly sophisticated and diverse GIS technologies have grown out of that vision to help us plan for the next 50 years and beyond. The first forays into GIS-based geodesign tools began in 2005 with the development of ArcSketch, an ArcGIS extension that gave users the ability to quickly draw new landscape elements on top of maps and imagery. GeoPlanner for ArcGIS built on these capabilities, providing additional tools for designing in scenarios and evaluating the impact of those scenarios against key performance indicators. Soon, a new generation of geodesign tools will emerge—many of which will be demonstrated at this year’s Geodesign Summit. GeoPlanner for ArcGIS is used to create, analyze, and report planning scenarios. Esri is leading a revolution in urban planning that promotes collaboration between real estate developers, urban planners, and residents. Currently in development, ArcGIS Urban is a web-based solution that will provide a new set of scenario-planning tools and capabilities for urban geodesign. With ArcGIS Urban, users can visualize proposed zoning changes and developments in 3D, evaluate impacts, and determine where and how much to build to meet current and future community needs. 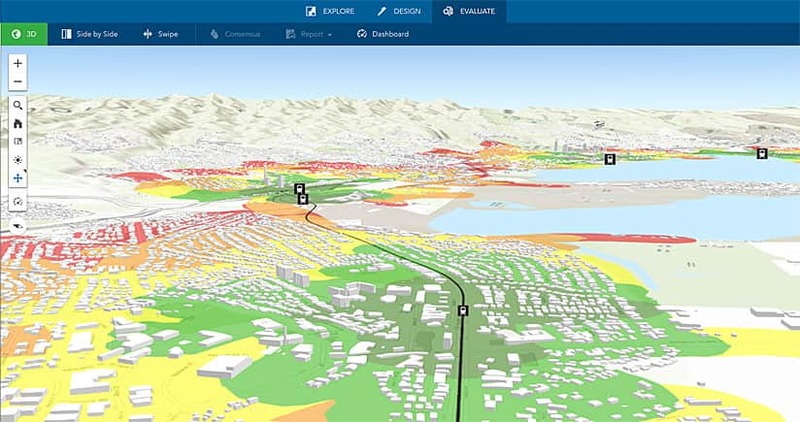 The 3D maps and indicator dashboards in ArcGIS Urban provide a central overview of active plans and projects in a community while delivering powerful data and analytics into the hands of planners and stakeholders who are managing urban growth. With ArcGIS Urban emerging as a premier tool for city planning, GeoPlanner for ArcGIS is being reimagined as a more focused tool for regional planning. It will be relaunched as a tool for landscape-level and open-space planning, with potential applicability for regional conservation designs, forestry management, environmental modeling, regional land-use planning, and more. Venturing into new frontiers in geodesign, Esri is currently developing ArcGIS Indoors, which introduces a new paradigm for managing and navigating our increasingly connected buildings and workplaces. It is a complete indoor mapping system providing users a common language for understanding, managing, and interacting with their workplace environment. In other words, it is built to enable, engage, and empower the workplace. ArcGIS Indoors reveals gaps between the existing workplace and the workplace that is needed to make future operations more efficient. As a geodesign tool, ArcGIS Indoors will be used to plan workplace activities, optimize the resources used in those activities, and improve the experience and well-being of workplace occupants. 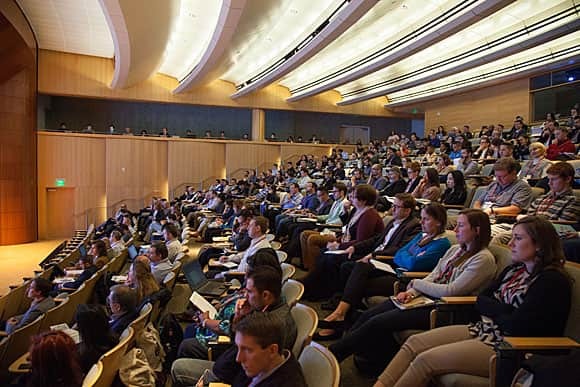 Geodesign Summit attendees include urban planners, architects, students, and others interested in learning about better planning technologies and strategies. Geodesigners are in the business of designing that road, with GIS technology, communities, and nature. While the issues are many, and the scale and urgency are daunting, the sparks of innovation ignited by this annual gathering at the Geodesign Summit light the way forward.